Pack away your winter coats and thermal wear; signs of spring are everywhere! 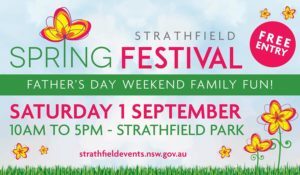 With warmer weather, flower blooms and love birds’ nests, enjoy the first day of the new season at Strathfield’s biggest event, the Strathfield Spring Festival! Radio 2RDJ FM 88.1 will present a live broadcast from Strathfield Park between 10 am and 4 pm. Entry is free, and the day will be filled with various entertainment, activities, shows and delightful cuisines! As a family-friendly event, the Spring Festival will be the perfect way to celebrate Father’s Day weekend. Council is raising funds for drought-stricken NSW Farmers; join us and make a donation by visiting Council’s Community Services stand at the Spring Festival. All funds will go to Rural Aid who will distribute to NSW Farmers on our behalf. Live performances and meet and greet with PJ Masks and ABC Presenter Nay Nay.